Before this vacation, neither of us had stayed at a bed & breakfast. I always thought they sounded romantic. Then, last year, after we had made our reservations, I watched a TV show in which the main characters were staying at a B&B. They were really uncomfortable and were trying to avoid all of the other guests who wanted to chit chat with them. That made me a little nervous. I wasn’t so nervous that I wanted to change our Oregon plans, however! We left the Newport Belle Bed & Breakfast this morning and are now staying in a little cottage in Cannon Beach. After this, we’ll head to Portland to stay at a resort. This means that we’re done with our bed & breakfast stays. Overall, our stays at the B&B’s were fun and we definitely would stay in B&B’s again! Staying in a B&B is a little like sharing a house with other people. There are some common areas, like the dining rooms and living rooms. Youngberg Hill also had a library and a game room. We weren’t sure how much interaction to expect with other guests. On our first night at Youngberg Hill, we decided to head to the game room to see if they had any good games. We expected to see the other guests there, but everyone else was out. We didn’t see any of the other guests until the next morning at breakfast. The breakfast room was set up to encourage interaction. We sat at tables with other guests, which was a little uncomfortable at times. I think it was mostly uncomfortable because all of the other people staying there were older people who were wild about wine. We enjoy wine, but we don’t really know enough about it to hold long conversations about it. We met some nice people, but it was a little hard to keep coming up with topics for conversation. There was a lot of talk about how hot it is in Phoenix and how cold it is in Chicago. We didn’t interact much with others on our first night at the Newport Belle & Breakfast, but by the end of our stay, we were totally into the B&B groove. We hung out in the living room in the evening reading Harry Potter while the others did their crossword puzzles and played scrabble, and this morning we were sociable at breakfast. It helped that the people staying at the Newport Belle were more interested in talking about traveling plans than wine. We got some good tips about where to go and what to do on the remainder of our trip! By far, the best part of staying at bed & breakfasts is the breakfasts. We have had the most amazing breakfasts the last few days! The homemade granola at the Newport Belle was fabulous, and we’re bringing the recipe home! Port of Newport – redundant much? So we’re now in Newport. For those of you who may have lost track, that’s the third of our trip locations (5 total). We drove in to stories of uncommonly good temperatures and sunny weather. According to folks around here, the past couple of weeks have been rainy and overcast, so it seems that the Arizona sun has followed us to Oregon for a little R&R as well. While in Newport, we’ll be staying at the Newport Belle Bed & Breakfast, an old paddleboat that has been converted into a 4-room B&B. Run by Michael, his wife, and his Scottish terriers (his first-mates), it is a charming little place with a lot of personality. The room that we acquired is their most popular and faces west, across the bay bridge and into the Pacific. The room is a little small (what would you expect on a boat?) but wonderfully cozy and fun. So we drove the rest of the way down to the B&B only to find that our room wasn’t ready yet (we were an hour early). The proprietor suggested that we check out a marine science center maintained by Oregon State University, just across the parking lot so we did exactly that! Much like an aquarium, it was focused more on academic research and local environmental concerns. Yet, it still had the touch-tanks with fishes and anemones and whatnot. Finally, we went back to the boat. By this time, the wind was raging and as Michael showed us up to our room (it has an outside entrance) he had to shout to make himself heard. The riverboat is moored right next to the quay, as far back from the bay and open water as possible, but Emily and I could still feel the boat rocking gently in the wind. So much so, actually, that later we found ourselves noticing the lack of it on dry land! Taking a recommendation from Michael we headed off to “Historic Newport Bayside”. I put the name in quotes because Michael conveyed that what’s there now is hardly historic. Arriving, we could see what he meant. There were a few commercial fish processing plants, but much of the bayside had been taken over with craft shops, souvenir shops, and restaurants. We didn’t really mind all that much, though. It had a familiar feel and it didn’t take us long to make the association – Sedona. A lot of the trinkets had the overly artsy feel of the stuff you can get at Sedona. Walls of look-alike pieces with featurettes about the artist and such. After a while we began to get hungry and started looking for food. For those of you who know me, it should come as no surprise that I wasn’t especially excited about the smell of the fish processing plants and the prospect of seafood. Yet, as we walked up and down the bayside, we saw nothing that offered alternative hope, so I set my mind to trying to pick out a place that might offer a nice, safe, plate of fish and chips. I figure some bland halibut wouldn’t do too much harm. After stopping by a couple of places that were full out the door, we finally saw a place that looked promising and available, it had large windows facing the bay, and a nice atmosphere. Upon getting the menus, though, we almost choked on our waters. The price of the plates were easily twice as expensive as I would expect to spend in any other place, even in a tourist trap like “Historic Newport Bayside”. We were committed, though, so we ordered fish and chips. I got the halibut and Emily the salmon. What was served to us were certainly recognizable as fish and chips, but hardly deserved a third of their price. The fryers clearly needed to be cleaned – the batter was burned with that dirty-oil smell wafting off of them. The fries were limp and exuded the same odor. Happy food was not to be. Yet we were entertained. As we sat, munching on our food, we noticed a small flotilla of sail boats coming around a headland from deeper in the bay. A number of them were happily scooting along the water, clearly in their element. 3 or 4 of them, however, were not doing so well. They were listing over heavily and had trouble maintaining a straight course. A couple of times we were certain that the sailboats were going to capsize, but they simply leaned over so far that the sail was effectively horizontal with the water and the wind stopped pushing them over. For anybody who might be interested, what happens next is that the nose of the boat grabs the water and it turns sharply into the wind until the boat can right itself, with the wind running in parallel to the sails. This must have been a source of great relief to the mariners on the boats who, I have to presume, had to change their shorts after disembarking. You know that you’re a weird cat person when you’re on your honeymoon and think to yourself “I miss my cat”. We are now on the second leg of our Oregon adventure. We’re staying at Youngberg Hill Vineyard & Inn, a great B&B in the middle of Oregon wine country. The Inn is absolutely beautiful. We’re at the top of a hill and have a fabulous view of the vineyards and forests below. It feels very peaceful here. Yesterday we spent some time relaxing on a hammock in the afternoon and then played a game out on the deck in the evening. We woke up this morning and had a delicious breakfast of homemade scones, spiced apples, puffed pancakes with strawberries, herb-seasoned eggs and bacon. It was wonderful! We headed out to the deck to read (We’re both reading the latest Harry Potter), and then went out the afternoon for a tour of a local winery. We wanted to learn how wine is made, so we headed to Domaine Serene, an estate winery that specializes in Pinot Noir. A vineyard is an estate winery if the grapes are grown there AND the wine is made there. Youngberg Hill makes wine as well, but their wine is made someplace other than where we’re staying (so it isn’t an estate winery). We had fun on our tour of Domaine Serene. The tour guide explained the process of making wine and showed us where the grapes are sorted, fermented, and sealed in barrels. In the distance, we could see a machine bottling wine. I really wanted to see it up close, but that didn’t seem to be an option for us. The tour was interesting, and it ended with a wine tasting! We tried several varieties of Pinot Noir made by that winery. It was fun to taste them and observe how different they are. Even though all of them are made with the same type of grape, the wines taste different because the grapes are grown in different types of soil and because they are fermented and stored for different periods of time. Wine is so interesting! The wine at Domaine Serene was very good. I say that not because I know the difference between good and bad wine, but because they’ve won so many awards. Their wine was even served at a big party in the White House recently (I know because they displayed a letter from the White House in their office). Domaine Serene is also expensive, but we decided to buy a couple of half-bottles to bring home. We figure that they will be nice mementos of our time here in the Willamette Valley. Well, we’re arrived in Portland! The flight in was pleasant and relaxing.No bothersome security or attention or anything. We boarded our plan after munching down on a couple of cinnabons (YUM!) and standing in line for only 10 minutes. Emily was wonderful and pre-boarded us while getting ready for her wedding…isn’t she amazing!? So we touched down in Portland after getting a couple good hours of reading Harry Potter in (and thoroughly disgusting our neighboring passengers with our googly-eyes. The airport at Portland International Exchange (or whatever they call themselves) was great. Finding our luggage was easy, getting to the car pickup was a snap, and getting our car was a breeze. Within 30 minutes of touching down we were on the road and off to try to find our hotel. Lest I sound like I have rose-colored glasses, I must say that the freeway system around Portland city center is a little lacking. Actually, that’s not fair, it was not bad at all. I was just ignorant. I’ll spare you the messy details, but suffice to say that I did 2 complete circuits around the city center and was embarking on a third when we decided to give up on the directions provided and struck out on our own to find the place. With Emily’s able directions and my crazy swerving, we were finally able to both pinpoint our location and navigate ourselves to the hotel. Sadly, we didn’t really take into account the fact that we had arrived early in the morning and our room wasn’t ready, so we checked our baggage at the bell desk, turned our car over to the valets and started walking…and walked…and walked…and walked. Portland city center really is a very beautiful place. It strikes me that it is very much what Flagstaff would become if it ever grew up to be a full metropolitan hub. The buildings were fun and had all kinds of personality. The people were friendly (I lost track of how many people stopped right in the middle of the street to allow us to cross, even though we were nowhere near an intersection) and the air was clean and wholesome. We first wandered over to get some lunch at a place called Greek Cucina (or something like that). Sadly, this wasn’t as positive an experience. We were seated next to a couple of kids who seemed pleasant enough, themselves, but their waitress clearly knew them (or at least I hope she knew them) and exhibited a vocabulary to make a sailor blush. Not only that, but out waiter took a good 15 minutes to find us, just to bring our drinks. We didn’t leave a tip. I feel a little bad. But anyway, from there we decided to walk to the Saturday Market, a venue that is highlighted in all of the travel guides we had read and that was singled out by our concierge as a good way to spend our time while they prepared our room. The Market was close to exactly what I expected it to be; Smaller than than I had thought it to be, it was full of the sorts of eastern trinkets and crafts that fill a thousand shops in Flagstaff and Sedona. It was charming for a while, but eventually it began to wear on us a little…while we love Flagstaff (and Portland’s market) and I could happily visit it any time, the heavy eastern influence can become cloying and overpowering so we decided to wander off to the riverside park, a short stroll from the Market. We strolled up and down the riverside, crossing the river at an old 2-story bridge that rumbled every time a train passed overhead. Eventually we tired of the riverfront as well and wandered back into the city center. We walked past all kinds of buildings with ancient-appearing facades. What grabbed my attention was how the modern stores integrated so well into the old buildings. We were also charmed by the tri-max – a free tram system that circled around some of the more active areas of the city center. Sadly, not all was beauty and charm. One thing that particularly grabbed us was the number of bums. I don’t say homeless because I’m not convinced that they are homeless. They seemed a mix of the hippies that can be found in Flagstaff and beach bums from California and they were *everywhere*. What amazed me was they had no problem holding signs that said things like “I want your weed” or “I want to get drunk”. Clearly these aren’t people who are on the narrow edge of living or starving. Normally I feel bad passing homeless people and not contributing. I felt no remorse for ignoring the bums, though. So we wandered around until we heard loud cheering and shouts and went to investigate. As we rounded a corner, we found a square so like Heritage Square in Flagstaff that we suspected that the designer in Flag had at least visited Portland. In the middle was a long platform and 19 men in drag were doing a can can. It turns out that smyrc (Sexual Minority Youth Resource Center) was having an awareness/fundraising event and had just set the world record for drag queens dancing in a line (isn’t it weird the things that there are records for?). Tired from all of our walking we sat down in a shaded corner of the square and watched as the queens danced and visited with people in the square. Finally we were tired so we wandered back to our hotel and checked in. You can see pictures from the room in our photo gallery here. The room was beautiful (though not as large as we had expected) and had an amazing window that allowed a magnificent view of the sky (even though it had become cloudy). We spent the rest of the evening in, venturing out for a brief dinner at Rock Bottoms. For those of you who couldn’t make it to our wedding, we successfully completed our wedding ceremony and are now married!! The ceremony was beautiful and we enjoyed our reception. Of course, we had some problems (all weddings do!) Our harpist never showed up, so we had no music at all during the ceremony. Also, the flower girls and ring bearer were sent down the aisle before Dave was in place, so he didn’t get to see them walk down the aisle. At first, I was bummed about the music. It felt funny to walk down the aisle with no music at all. In the end, though, we really liked our music-less ceremony. It added a sense of simplicity. We are now enjoying a relaxing day in Oregon. We are staying at the coolest hotel! We have two walls of angled windows that allow us to look up at the sky from bed! One week from today, Dave & I will be married. We have been waiting to be married for so long that it’s hard to believe that the time has finally arrived! Big changes are coming after this week. It is is my last week as a single person, my last week living at my mom’s house, and also my last week in my summer job as an ESL teacher at Phoenix College. This is a picture of me with some of my students. 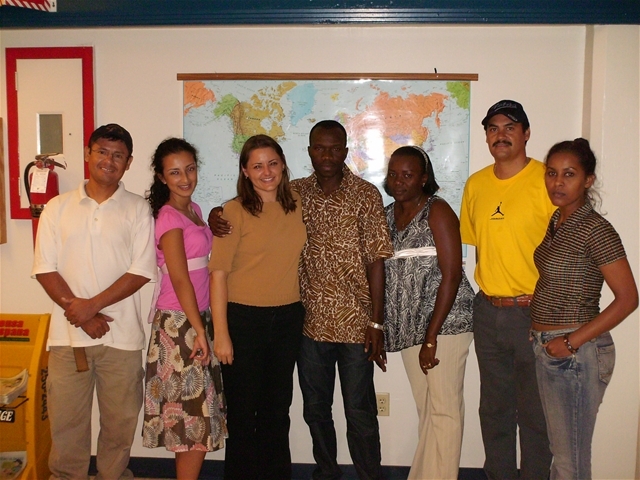 The students in this class are from Mexico, Cuba, Uzbekistan, Togo, Sudan, and Ethiopia. I really love the diversity in my classes. I love hearing about their cultures and learning about their differing viewpoints on life. Teaching ESL is so much fun. I’m so blessed to have a job I really love!